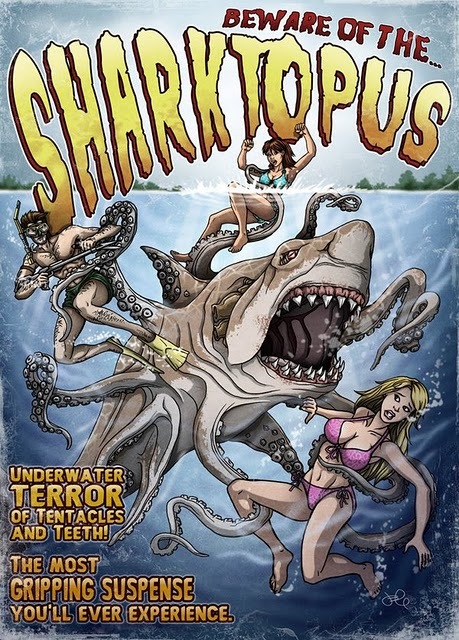 Roger Corman and Eric Roberts team up with a crack team of effects artists to create an incredibly life-like simulation of Eric Roberts and a giant, bullet-proof shark-octopus hybrid which—somehow—gets out of control. It’s an age-old story of love and loss, and I watch it for the first time and never, ever, not-even-once compare it to Mega Shark vs Giant Octopus. Watch it with me as I try to piece together the complex story and explore structure, theme, and buckets and buckets of Kensington gore. 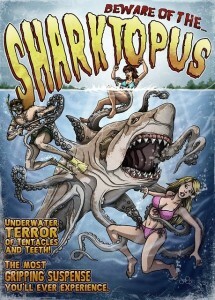 I sing a little “Sharktopus’s Garden”, compare it to La Dolce Vita and Jaws, and come up with some ideas (copyright!) for more sea monster movies. Start the movie with the countdown just as the title card has faded to black. You have truly made my day. I was feeling a little down, so I came to the site to download your Megashark vs. Giant Octopus commentary as it always picks me up. I type in “Octopus” and to my surprise and delight, I get your commentary for Sharktopus! Yes, I would have seen it shortly on Zarban’s list… but this was like an early Hanukkah present. You are correct in noting that this is low on the sharks eating planes quotient… but they can’t all be winners.